As someone who doesn’t mind journeying to kayak on beautiful bodies of water, I find traditional kayaks to be a bit cumbersome. They tend to be quite a burden to tour with unless you have the right vehicle. This is why folding kayaks can make all the difference when you need to travel. They fold up, making it easy to carry around with you. This article contains some of the best folding kayaks available. To distinguish the good from the mediocre, there are a few elements that I have focused. First is the quality of the frame as well as the covering. Then, it is the ease with which the kayak can be assembled and disassembled. Finally, I considered the overall volume of the kayak once it had been packed up. What Size and Weight Should You Get? Are You Looking for Speed or Maneuverability? How Easy is it to Assemble? The Folbot Touring Cooper foldable kayak has earned itself a reputation as one of the best folding kayaks around. This is because it ticks quite so many boxes concerning what you look for in a foldable kayak. Let’s start with the assembling (and disassembling) process. The Cooper doesn’t require any tools to either be put together or pulled apart. This makes it quite easy to set it up even on the shores of a beach or a river. Also, the frame is assembled first and then the covering is pulled over it. Once you have gotten used to constructing it, it really shouldn’t take you more than fifteen minutes to get it fixed up. The frame is made from lightweight aluminum. This lends the kayak durability without adding unnecessary weight to the frame. The covering is equally as impressive. It is made from Elvaloy. Although there is a certain degree of flex to the material, it is undoubtedly tough. It is resistant to tears, punctures, and UV rays. The Cooper is equipped with a seat that can be added later. Fully assembled, the Cooper stands at around sixteen and a half feet, with a width of 24 inches. The cockpit is also quite roomy, with plenty of space to stretch out your legs. Due to the length and the design of this kayak, it is actually quite fast. The tracking is quite impressive as well. I was pleasantly surprised to find that this kayak, despite the materials, is very stable. Although not overly light, the kayak is a little under 40lbs when it is packed up. 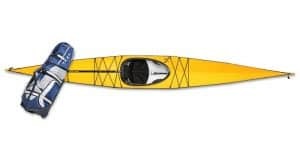 The Folbot Touring Kiawah kayak is for those who value maneuverability over speed. This is due to the fact that the Kiawah is a little shorter, with the length and the width balancing out a bit more. Although the kayak is not all that short – it is a little over thirteen feet, you will be slightly making a compromise with speed. It will not pick up speed quite as well as kayaks with longer frames. However, the more compact size, does make it lighter as well. The Kiawah weighs in at around 32lbs, which certainly makes a difference when you need to carry it around. Once disassembled, the kayak neatly fits into a bag a little larger than a backpack. It is quite easy to assemble and you will not need any tools to do so either. The frame is made from anodized aluminum, which means that it is less likely to corrode even if it is frequently in the water. The Elvaloy covering is tugged on once the frame has been set up. The hull is good at withstanding most minor dings and damages and can even withstand the UV rays for an extended period of time. The beam on this kayak is quite wide, making it incredibly stable as a result. The hull has been specifically designed to have improved tracking once the kayak is in the water. The kayak is equipped with a molded seat and foot pegs. The hull of the TRAK Kayaks T-1600 Performance kayak is the same as with traditional kayaks. It is made from polyethylene. This alone, speaks to the durability of the hull since it is capable of withstanding just as much as a solidly built vessel. This isn’t even the best part about the kayak, however. The versatility of the T-1600 is what really makes it stand out. It has three hydraulic jacks that help to change the shape of the hull to suit your needs. You can make it lie flatter if you want the kayak to move faster. If you are looking to improve maneuverability, it is simply a matter of increasing the tension so that the vessel bows up. In the event of crosswinds, you just have to direct the kayak into a left facing or right facing crescent. Due to this, you can take out the kayaks in different weather conditions and on different waters as well. Another one of the things that I liked about the T-1600 was the plenty of direction provided by the company. This made it a lot easier to put the kayak together the first time around. Even beginners will find it relatively easy to set the vessel up. At full length, the kayak measures 16 feet. The only complaint that I have about the T-1600. It is a whopping 48lbs which means that you are going to need some serious strength to carry this around by yourself. That, unfortunately, is the price that you have to pay if you want something as close to the real deal as possible. If you are not looking to lug around a large and heavy package, the Folbot Recreational Citibot foldable kayak is just what you need. All folded up, this vessel weighs just 24lbs. While the kayak is lighter, it does not compromise on durability or safety in any way at all. The Citibot, too, relies on the tried and true combination of aluminum and Elvaloy. As a result, the frame of the kayak is protected against corrosion. The hull has been constructed to be able to handle scratches and minor damages. It also holds up well against continuous exposure to UV rays. It also follows the pattern of the frame being made up first and then the hull being pulled over it. The Citibot is quite wide which means that you can enjoy improved balance. At the same time, the frame doesn’t measure more than ten feet. Therefore, you can’t expect the kayak to go very fast. I did find that the tracking with this kayak is more than adequate and will hold up well against most weather conditions. You will be better off if you stick to smaller bodies of water, preferably those without currents or too many waves. One of the downsides of the size of the kayak is the limitation of how can fit in it. Even people of average height may find this to be a tight squeeze. 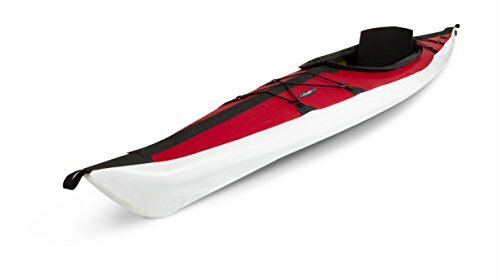 If you are on the smaller side and lacking in space to store a kayak, however, this is the best option for you. The Oru Kayak Bay kayak does get a lot of things right which is why it is one of the top choices for folding kayaks. One of the reasons that it has been so widely advertised is the clever technique that goes into folding up the kayak. 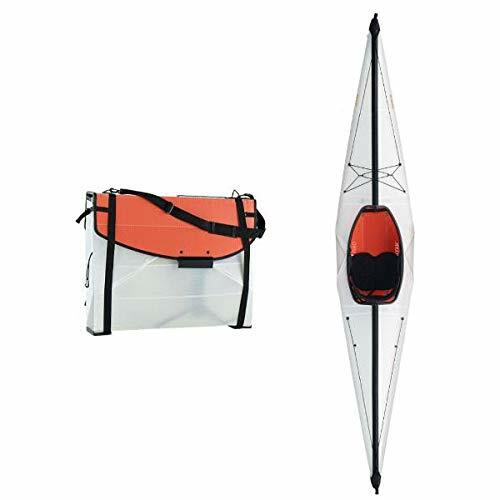 Unlike most other foldable options, it is the carrying bag and kayak all in one. The polyethylene body acts as the hull when the kayak is unfolded. However, it is also the bag that contains the frame. Admittedly, the overall size of the Oru Bay package is a little awkward. At just a little bit over 32lbs, it isn’t all that heavy, nonetheless. One of the perks of this kayak is that it is actually relatively simple to set it up. I struggled with it at first, but the construction time considerably lessened as I got the hang of it. The other advantage is that it is made to be folded and unfolded. Oru guarantees that it can withstand up to 20,000 folds, no problem. Although the Bay kayak is quite stable, this is something that performs best on calmer waters. Larger waves or even strong winds can make the journey a lot less pleasant. While it is a durable kayak, you should be careful with it. It has the tendency to wear out with continuous use. All in all, it does offer a fun experience to both experienced and beginner kayakers alike. At first glance, the considerable price tag on the TRAK Kayaks Seeker Performance kayak can seem quite off-putting. However, one of the main selling points of this vessel is its toughness and durability. This is a good thing as it mainly targets those who want to get their kayaks onto rougher waters. In terms of resilience, it is hard to beat the Seeker. The hull is made military grade polyethylene while the frame is constructed from aerospace aluminum. You get quality that is equivalent to that of a typical, hard shell kayak. The only downside here is the added weight. Fully constructed, it weighs about 48 pounds and a lot more when packed up. This is not a kayak that you can take hiking with you, that’s for sure. That being said, this vessel does boast the truly innovative feature of three hydraulic jacks. With the use of these pistons, you can either increase or decrease the curve of the hull. This means that you get to choose if the kayak exhibits more stability or maneuverability by working the pistons. Considering the kayak is sixteen feet long, this is certainly a handy feature. So, what about the claim that this kayak can handle any current or waves that it encounters? I would certainly classify the kayak as capable. At the same time, there are limits to just how well it can perform under these conditions. Nonetheless, for the quality that you get, this kayak is certainly worth its cost. The material that are used for folding kayaks tends to vary by the company as well as the purpose for which the kayak is meant. To start with, let’s first consider the material made to make the frame of the vessel. The most common one used is aluminum as it is lightweight yet sturdy. There are different types of aluminum used nonetheless. Now the untreated versions may be prone to corrosion. Nonetheless, anodized and aerospace aluminum may be more resistant to such exposure. Although it is not used as widely, wood is also sometimes utilized. This is due to the flexibility of the material. Although it is quite resilient, wood tends to require a great deal more maintenance. You cannot expect it to last as long, either. The body of the kayak can be made from a number of things although polyethylene is most popular. As with aluminum, there are variants on the polyethylene with military grade and Elvaloy polyethylene being stronger. The main thing to look out for with the body is just how tough it is. You will need materials that will not corrode or get damaged easily. It is also a definite plus if it is protected against UV rays as well. Is the main reason that you are getting a folding kayak so that you will be capable of carrying it from one place to another by yourself? Are you planning on hiking with it? Your strength also plays a role in this decision as well. If the answers to the above questions are all yes, then you should look for kayaks that are relatively light. These will typically weigh between 22 and 33 pounds. Of course, lightweight kayaks are not compatible with everyone for one reason. This is because the lighter a kayak is, typically the shorter it is and the less that it can carry. Therefore, if you are tall or weigh a certain amount, you are going to require a kayak that can sustain you. This is why you should carefully consider these details too before you buy a kayak that is too light. The length of the kayak can give you some idea of how fast it can go. Typically, kayaks that are narrower and longer, tend to exhibit speed. The problem with kayaks that are quite long, however, is that they are difficult to handle. This can make it quite difficult to turn and maneuver. Shorter kayaks, on the other hand, are easier to turn but won’t get you the speed that you are looking for. Often, you will be able to find kayaks that make a compromise between these two factors. Of course, most manufacturers will boast that their kayaks can be constructed in ten minutes or less. Not all folding kayaks can live up to this claim, nonetheless. This is why when you are choosing a kayak, you need to find out how easy it is to set up and how long will it take you. It is best to stay away from folding kayaks that require tools. Not only does this increase a number of things you have to carry, it can be difficult to use tools on a beach or lakeshore. Fortunately, many kayaks just require you to fit one piece into another to put the kayak together. Now, if you haven’t ever used a folding kayak before, it is going to take some time to learn. Over time, you will be able to set up everything a lot more quickly. What does matter, however, is just how many instructions the manufacturer has provided you with and whether they are clear or not. Not only should the kayak be easy to assemble, it should be something that you are capable of managing by yourself. Whether you are searching for the right folding kayak for you or want to know what to look for, this guide will help you. You can use it to ensure that you pick a kayak that is tough, safe, and is easy to construct.